June 3, 2014 By Elizabeth Lindemann 17 Comments / This post may contain affiliate links. Well, this was a win. This was my first time making enchilada sauce from scratch and it is DEFINITELY going to become a staple in my house. And guess what? It’s almost exactly the same as making marinara sauce from scratch. The base is crushed tomatoes, with Mexican-flavored spices added to it instead of the Italian herb blend you’d find in marinara. 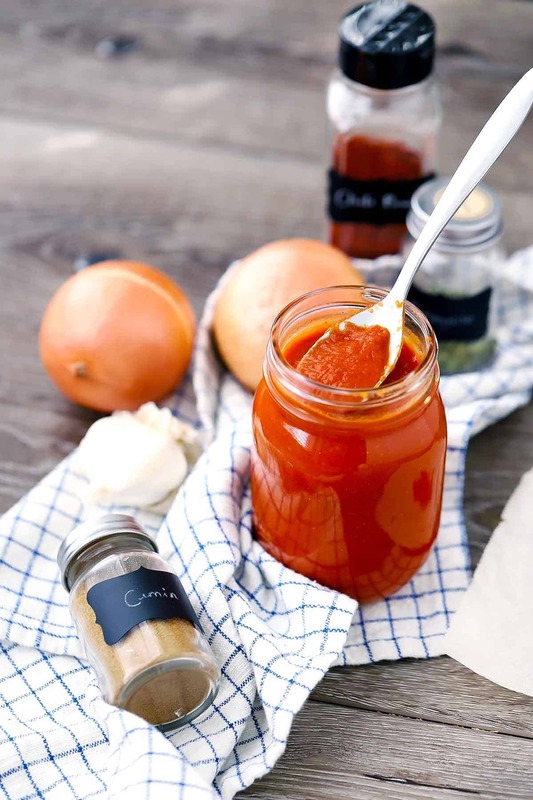 It can be made in bulk and frozen in mason jars, and adjusted to your comfort level with spiciness. Once you have the sauce made, all you have to do is whip up some enchiladas by rolling things in corn tortillas, covering with the sauce and cheese, and baking! Dinner in under 30 minutes. Boom. Speaking of which, I made chipotle chicken enchiladas with this sauce yesterday and will post about them later this week. One thing at a time. 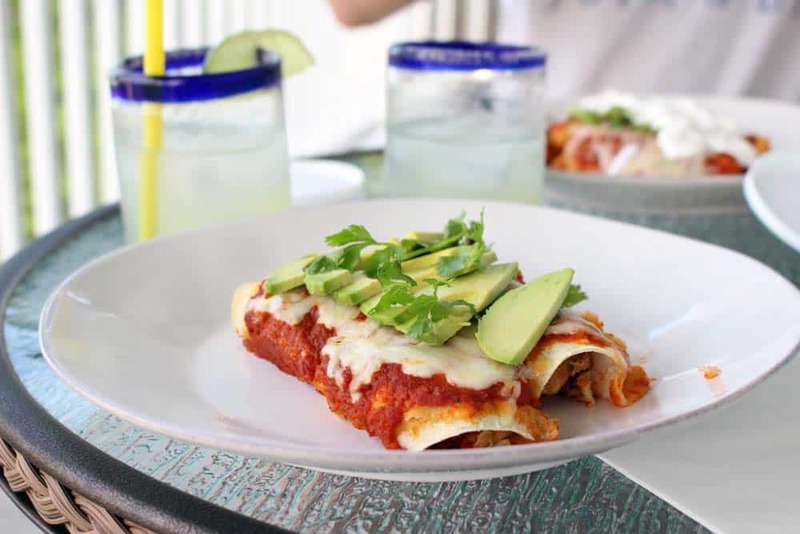 Meanwhile, here is a picture of the glory of yesterday evening’s al fresco enchilada and margarita dinner, now dubbed “Mexican Monday.” Stay tuned for more on that next time! I used canned chipotle peppers in adobo sauce for an awesome smoky flavor. Like spicy? Add about 5 chipotle peppers. Have a delicate palette? Stick to two, but if you love smokiness and are just not getting it with only a few peppers, add a little smoked paprika or more adobo sauce if you want. This recipe makes enough for two-three batches of enchiladas. Enjoy, and try not to eat it all by the spoonful while you are cooking it! Save some for a meal or two! Making enchilada sauce from scratch is healthy, DELICIOUS, cheap, and easy. This chipotle version is spicy, smoky, and full of flavor. It can be made in bulk, frozen, and used in multiple meals! Saute onion in olive oil until tender in a medium or large pot. Use an immersion blender or regular blender to blend until smooth. If too thick, add 1/4 cup water. To freeze, store in an airtight container or mason jar for up to 6 months. I made this tonight and it was SO GOOD. I added some smoked paprika, but that’s about it. We made pulled pork and spinach enchiladas. Yum! So glad you liked it! Those enchiladas sound SO good- I love spinach in enchiladas! Could I use this as a cooking sauce in the skillet? I don’t see why not! 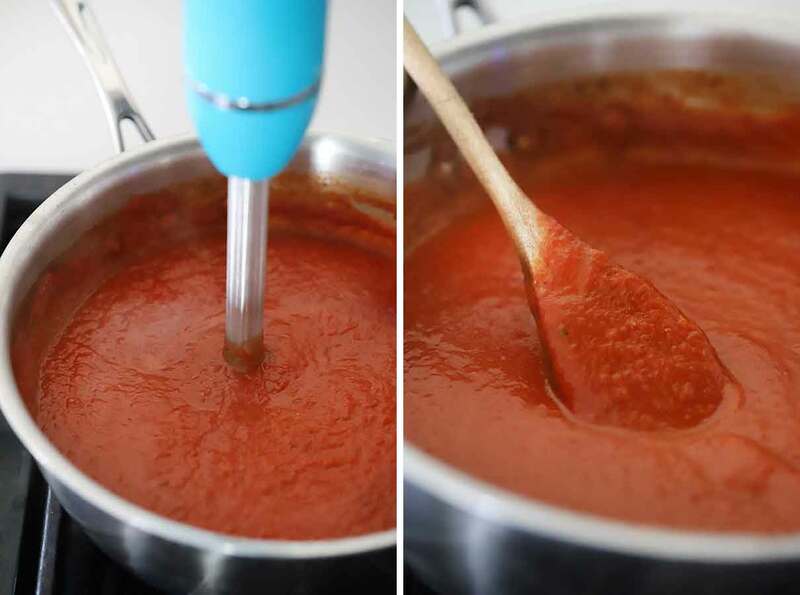 It’s similar to marinara sauce, so anything you’d use that for you can use this for. I think adding it to shredded chicken and then filling the enchiladas would be awesome. What kind of onion should I use? Which one would give the sauce a better flavor? I just used a yellow onion. Hope you like it! Have you ever tried canning it instead of freezing? 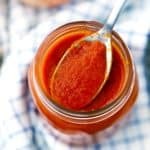 Just curious, I have a pressure cooker and tons of jars, I’m going to make some sauce this weekend because I am trying to duplicate something that a local food truck serves here so I can make it myself :) Love their food, and I love supporting local business, but I love saving myself money even more, lol! I’ll let you know if this sauce does the trick since I don’t want to use a bottled sauce if I can help it! So delicious! 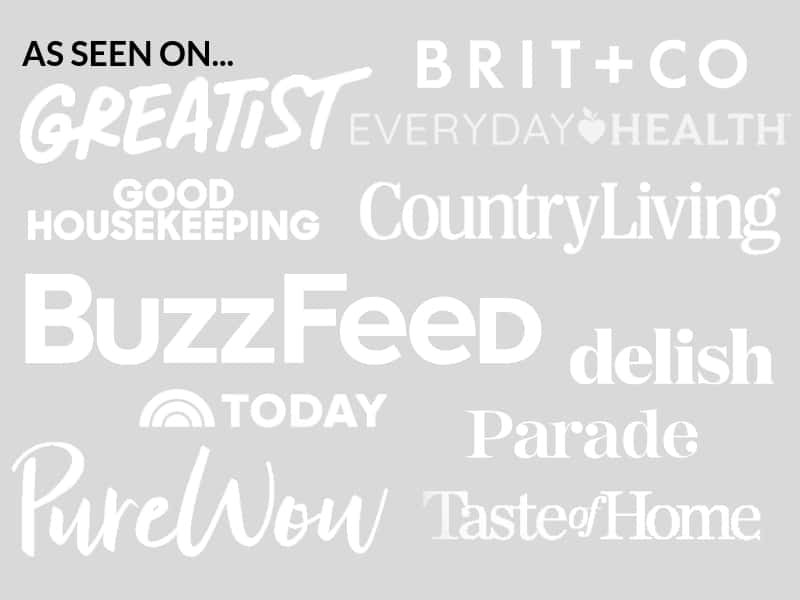 I just made this and was so happy with how it came out. I tried this tonight and I loved the flavor of the chipotles in the sauce. I used it with tofu, mushroom and red pepper enchiladas and it came out great, excellent recipe, thanks for sharing!